I have stated many times on this site how I believe essential oils help. I am walking proof that they do. Peppermint oil is one I can not live without. You have to make sure you find the purest of oils, which I recommend Young Living. I had heard about jewelry that diffuse the oil so you can get all day effects of the oil. I was mainly looking for my son who has ADHD and something he could wear this school year, and that is when I can upon EverTrend. They had so many nice pieced of jewelry to choose from and I am grateful I got the opportunity to review a piece. The best thing I love about this piece is that it is handmade right here in the USA. I love supporting companies that pride themselves on their work and craftsmanship. I even love the little brown packaging it comes in. How eco-friendly is that? This beautiful piece is so nice and light weight yet beautifully crafted. 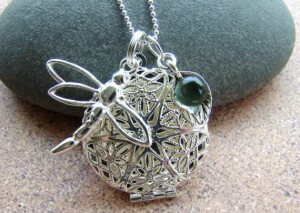 The dragonfly and the gem give it just a little extra style. Each piece comes with 3 felt disc so you can diffuse 3 scents. If you wanted a little color to show through, you could get some colored felt to use. My first mistake with these was over estimating how much oil one little piece of felt could take and how long it would last. Lets just say I was a bit over powered the first time I wore it. This just gave me more reason to love it. You only need a few drops of your favorite oil on the felt to get what you need to last you the day. 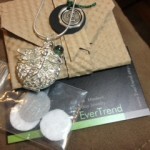 EverTread has all sorts of modern simple jewelry that will is perfect for anyone. They are not only beautiful but the prices are very reasonable and the craftsmanship is top notch. Please go check them out on Etsy and support your USA homemakers.